On May 7, 2016, U.S. Supreme Court Associate Justice Sonia Sotomayor Visited Wheelock College in Boston, MA. At this community conversation, U.S. Supreme Court Associate Justice Sonia Sotomayor discussed her autobiography "My Beloved World." U.S. Supreme Court Associate Justice Sotomayor and engage in a conversation facilitated by José Massó. A respected leader in many fields, Massó’s career has included prominent and groundbreaking positions in education, communications, media, politics, government, entertainment, sports, and philanthropy. 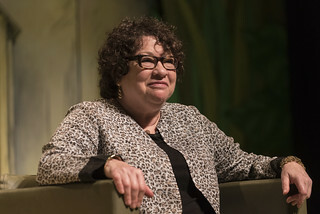 A reception with U.S. Supreme Court Associate Justice Sotomayor followed at the Wheelock College Earl Center for Learning and Innovation. Attendees had the opportunity to purchase a signed copy of My Beloved World. Since 1888, Wheelock College has been providing a transformational education to students passionate about making the world a better place—especially for children and families. Improving the lives of children and families isn’t always easy – but it’s always worth it. At Wheelock you’ll find an entire community committed to changing things for the better.